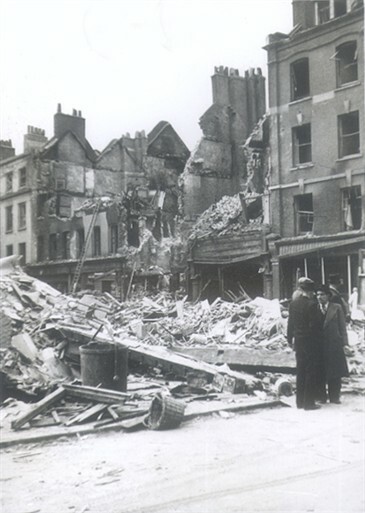 At 3.47am, 11 May 1941 - as bombs fell across the West End of London - a high explosive bomb hit the corner of Old Compton Street and Dean Street in the heart of this well-known Soho district. 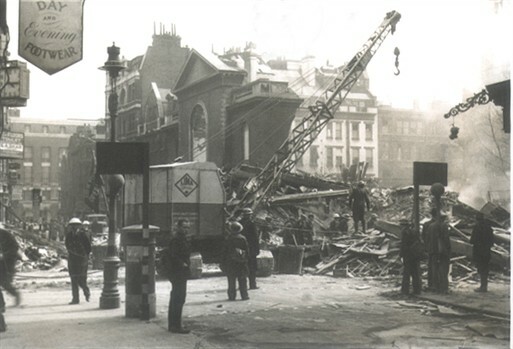 Numbers 59/60 Dean Street – including the popular 1920’s restaurant Patisserie Valerie – were completely destroyed. 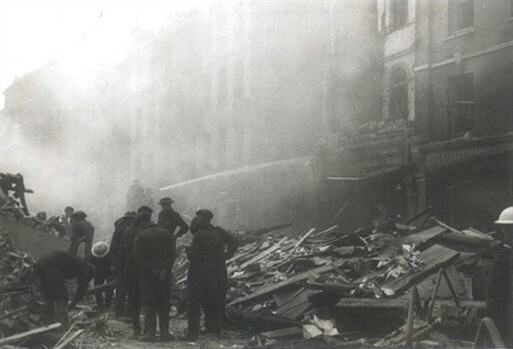 Early reports called for half of the 50 ambulances and aid workers on the way to another incident at Carlisle Street to be re-routed and sent immediately to Old Compton Street. 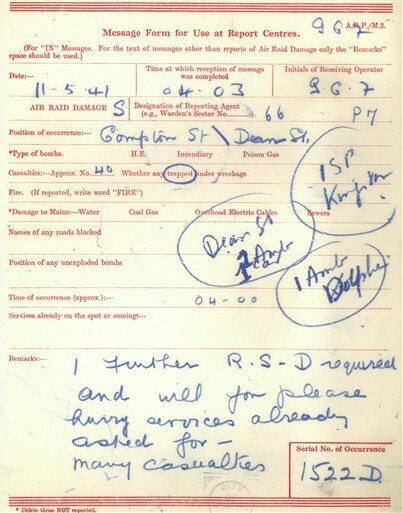 By 4:30am these services had still not arrived at the scene so multiple messages were sent to hurry aid. At this point, over 40 individuals were trapped in the debris of the demolished buildings. One hour later, workers reported that a fire was seriously interfering with rescue work. This forced abandonment of all activity at the site until the Fire Brigade could extinguish the flames. 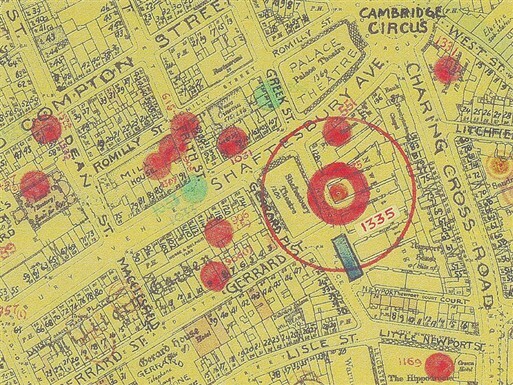 With massive debris as well as fire, roads were closed off and access to the bomb site was limited to an approach from Cambridge Circus and Soho Square. Eventually, mortuary vans were able to remove 15 fatalities from the scene, but the total number of casualties remains unknown. Rescue teams were called to remove a damaged wall threatening those trapped at the scene. 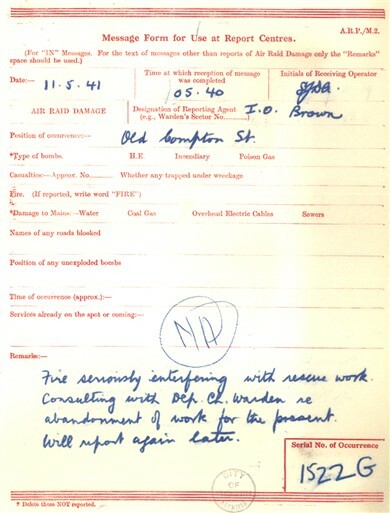 Reports closed with suggestions for a further survey of the site by the Fire Brigade: escaping gas was suspected as teams sifted through the debris. This page was added by Camilla Bergman on 21/06/2010.